It seems the liberal media has passed on allowing Trump to explain himself for a misunderstanding. There were many reports that Trump tweeted a picture of Hillary with a background of $100 dollar bills and a six pointed star. This tweet was quickly deleted. The media portrayed this as an anti-Semitic message. The claim was that the star was similar to the Star of David. The tweet was deleted and replaced with one that used a circle instead of the star. 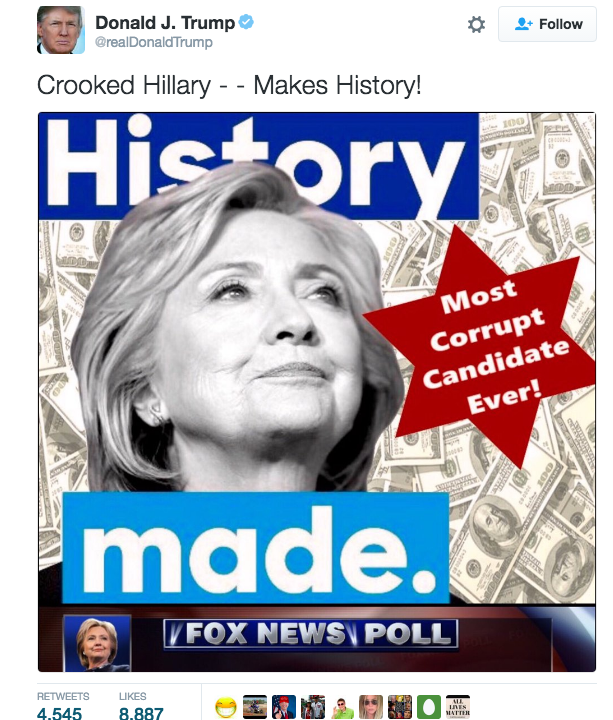 Instead of focusing on the intent of the message, which describes Hillary as the most corrupt candidate ever and not fit to be president, the media instead focuses on creating a conspiracy with regards to a star that was clearly not intended to be anti-Semitic. Must be nice to have the media in your pocket, Hillary.